I love a good pasta. It doesn’t matter whether it’s summer or winter, I can be easily convinced to whip up a pasta dish for dinner … and even more easily convinced to dig in when my husband cooks! This summer I’ve found a recipe that has quickly become my favourite go-to dish on those occasions I’d much rather spend the cool of the evening outside enjoying the twilight and the cool breeze than inside cooking. Cook your pasta according to instructions. Slice zucchini into ribbons lengthways, I use our mandolin to achieve thin, consistent results. Heat oil in a fry pan and cook your zucchini so it is slightly soft but retains a bit of crunch and texture, usually about 4 minutes, then add your spaghetti and pesto. Toss for a few more minutes until the pesto covers everything in the pan and serve up. I found this wonderful pesto recipe and used it for the first time when cooking the zucchini pasta and I couldn’t be more happy with the results. It has a full flavour, but doesn’t overpower the soft, buttery taste of cooked zucchini. In fact, they’re prefect partners! I make a batch and freeze half to use next time, which cuts down on prep time. One key to perfect pesto is chopping all the ingredients by hand, preferably with a sharp mezzaluna or knife. I gave my double-bladed mezzaluna to a friend last year because it was collecting dust (I also didn't like how ingredients would get stuck between the blades), but have a large half-moon shaped pizza cutter that works like a dream. Francesca's mom even approved and said it cut her chopping time in half. This pesto will keep a bit in the refrigerator, but it really hits its peak when served soon after it is made. The technique here is: chop a bit, add some ingredients, chop some more. I think part of the reason she does it this way (instead of chopping everything all at once) is because some things get chopped into oblivion, while some not as much - it encourages specturm of cut sizes throughout the pesto contributing to the overall texture. All told, the chopping took me a leisurely twenty to thirty minutes, I wasn't in any particular rush. You'll notice this recipe doesn't have any added salt (just the saltiness from the cheese), make sure your pasta water is well salted if you are going to use this pesto on pasta or the overall flavor profile will fall flat. Also, be sure to adjust for seasoning before serving. With food this simple, you need to get the seasoning right. Start chopping the garlic along with about 1/3 of the basil leaves. Once this is loosely chopped add more basil, chop some more, add the rest of the basil, chop some more. I scrape and chop, gather and chop. At this point the basil and garlic should be a very fine mince. Add about half the pine nuts, chop. Add the rest of the pine nuts, chop. Add half of the Parmesan, chop. Add the rest of the Parmesan, and chop. 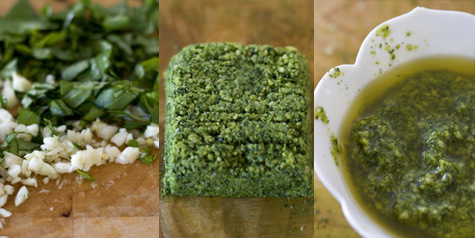 In the end you want a chop so fine that you can press all the ingredients into a basil "cake" - see the photo up above. Transfer the pesto "cake" to a small bowl (not much bigger than the cake). Cover with a bit of olive oil, it doesn't take much, just a few tablespoons. You can set this aside or place it in the refrigerator until you are ready to use it. Just before serving give the pesto a quick stir to incorporate some of the oil into the basil. She occasionally thins the pesto with a splash of pasta water for more coverage, but for our gnocchi this wasn't necessary.